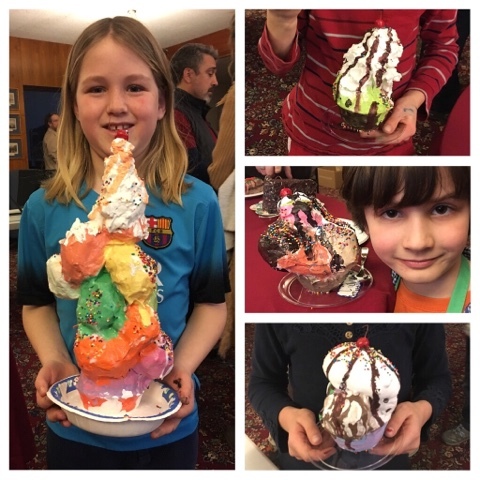 Do these ice cream sundaes make you hungry? 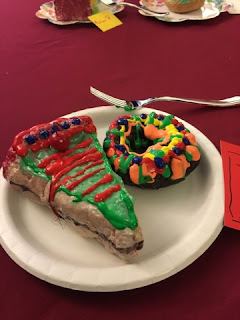 Or how about the donuts, cake, pie, and pizza in the photos below? Guess what, they are calorie and guilt-free, with lots of fiber, because they are NOT REAL!! Read on, and I'll tell you all about how my DragonWing Arts students made these yummy treats! 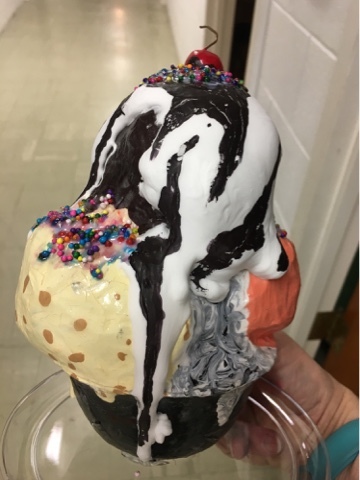 So - I've made ice cream cones with my students before, and I thought it would be fun to build dishes of ice cream this time. Then, in the Facebook Art Teacher group, I kept seeing pics of cake slices that kids had made. And then some donuts. And because I am frequently incapable of making a decision, (it's my Libra nature, always weighing and balancing), and because I wanted to try all these projects, the decision was obvious. Each of my 8 students would construct a sundae, a slice of cake or pie, a donut, and a pizza slice. We perhaps bit off a little more than we could chew! 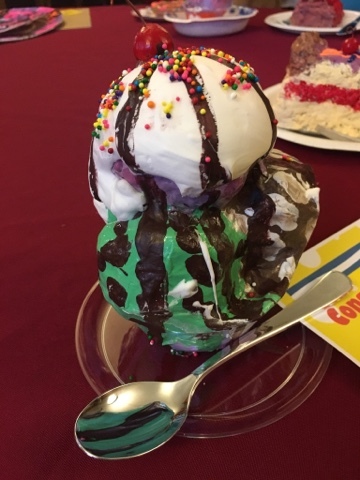 Our constructions began with simple stuff: cardboard, masking tape, newspaper, and tin foil, and also some plastic bowls from the dollar store for our sundaes. The pizza slices are chipboard triangles with a tin foil crust taped on. The donuts are hunks of foil taped in circle. The pies/cakes began as a taped-together cardboard structure. And the ice cream... we filled the plastic bowls with some tin foil for starters, and then made balls of newspaper, taped to a round shape. I hot glued the scoops into the bowls for the students. 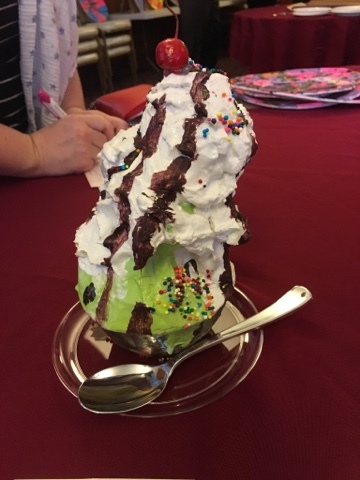 I told them they could make as few or as many scoops as they wanted. One enthusiastic boy made 14 scoops! The ice cream sundaes were covered with traditional papier-mache of torn paper dipped into Art Paste and layered on. We did one layer of newspaper and one layer of white paper to create a good painting surface. 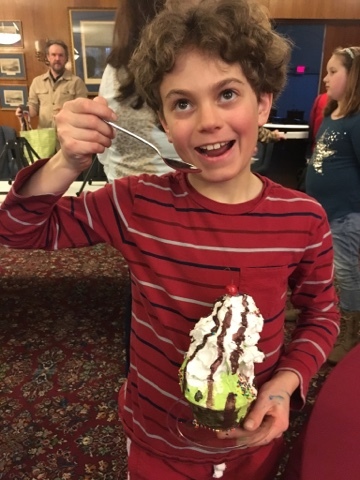 Below is the 14 scoop sundae, before and after! I know this doughnut (which spelling do you prefer, doughnut or donut?) pictured above looks a bit like an onion ring, but anyhow... I had seen a post by someone who said they had used a layer of papier-mache with toilet paper to get the doughnut texture, so I thought we'd try it. Over a layer of papier-mache done with newspaper, we tried a layer of toilet paper. NOT EASY!!!! I don't recommend it!! For the cakes and pies, everyone recommended Claycrete or Celluclay, kind of caked/smoothed onto the cardboard armature. While I have extensive papier-mache experience, I had never used either of these products. I purchased some Celluclay and while it ultimately worked, I strongly disliked it and gave away the leftovers. It was dusty to mix, and kept falling off the cakes. We ended up adding some glue and Art Paste to it to get it to stick. The pizzas were easy. 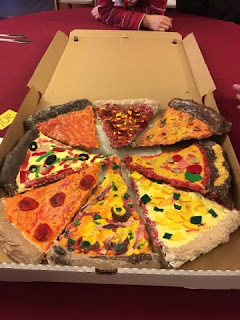 We put on a layer of Celluclay to thicken the cardboard and cover the crust, and then we added some toilet paper dipped in Art Paste, to create the cheesy texture on the pizza. When everything was dry, we painted with acrylics. I premixed a bunch of colors for cheeses, pizza sauce, donuts, ice cream flavors and toppings. Frosting colors could be anything! We coated with Mod Podge to get a nice shine on our ice cream and everything else too! When the cakes and donuts were dry, they were decorated with some puffy paint. Below is my lovely assistant, a freshman at the local community college and a former student of mine from kindergarten through grade 6 (I know we aren't supposed to have favorites, but yeah, I definitely have a soft spot for this sweet scrappy little gal.) It has been a huge help having her help out for the past 8 weeks, and I'm glad she got to make her own delicious ice cream sundae! We cut pizza toppings out of felt and stuck them into the wet paint, and painted over them a little too. I love that each student approached their pizza differently. Don't they look delicious? 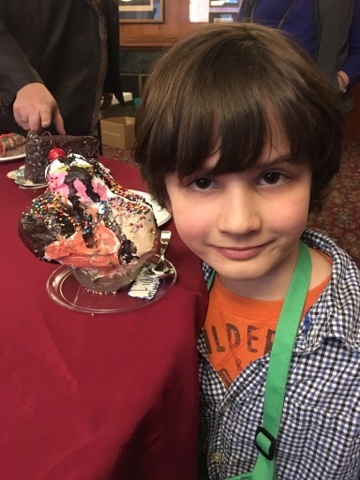 As for the ice cream, after painting the scoops, they needed whipped cream or marshmallow topping, and syrups, and sprinkles. 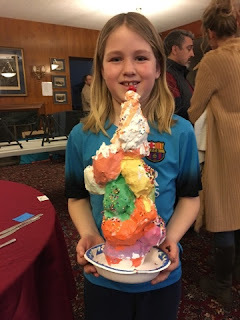 The kids were given a choice for their whipped cream/marshmallow: some chose a 50/50 mixture of Elmer's Glue-All and shaving cream (the girls below loved this stuff!! ), and the others used some freshly mixed plaster of Paris. I had a sample pack of some air dry clay, and quickly made cherries for everyone, with a piece of wire for a stem, and a little red paint. 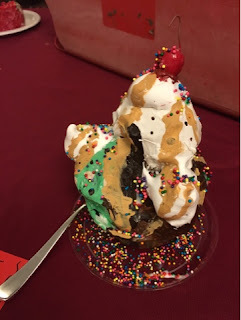 We hot glued them on the sundaes. Sauces were painted on, and then sprinkles were added, held on with Mod Podge. Yes, we used real sprinkles. I hunted for a good alternative and couldn't find what I wanted. And a few more pics of our goodies. We held an art show for the parents/families. There were also some paintings in the art show; I'll share them in another post. And finally, here's some of my lively kiddos during the art show, showing off their creations! Look at that delicious cherry sauce on the sundae, and a yummy piece of lava cake. Check out the boy on the left. 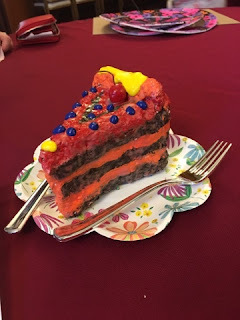 For some reason, I don't have a good photo of his cake, but you can see a snippet of it on the right side of the photo - all deep dark chocolate. It looks SO yummy. And his doughnut is chocolate too! Uh oh, it looks like dad's swiping this gal's doughnut while eating her pizza! 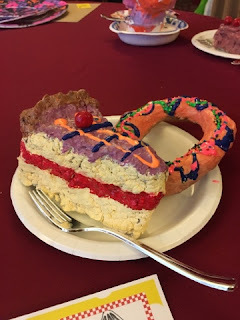 I want to give shout-outs to the many other art teachers/bloggers who have posted similar papier-mache pies, cakes and donuts; you inspired me and I thank you! 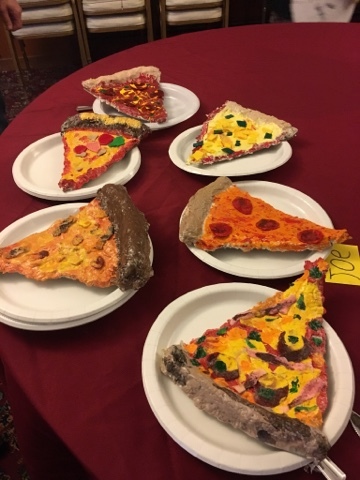 I want my readers to know that papier-mache cakes and pies are NOT my innovation. We ran out of time, and really rushed decorating the cakes, so I don't their decorations are as 'real' as many others I've seen. I've also seen other papier-mache pizza, though we did ours my own way. (Thank you to Angelina's Pizzeria for donating a box for us to display our pizza slices!) I do, however, claim those ice cream sundaes as my own inspiration, and I believe they look good enough to eat! Back on Martin Luther King Day, I attended a 4-hour hands-on workshop, sponsored by my region of our state organization (NYSATA). Actually, I didn't just attend; I was the chief organizer of the event. Because of that, it was quite a busy day for me, and I didn't get to finish the projects that were presented. I took home the partially completed work, and finally, over the course of the past week, I finally finished all three projects!! The workshop presenter was Phyllis Annett, a School Specialty Art Consultant. I first met Phyllis at our state convention several years ago, and because we share the same relatively uncommon name, we've chatted every year. Which is how we came to put together this busy workshop! My favorite project from the workshop was the flower pictured at the top of the post, though her sample was much more complex and elegant than mine. We painted watercolor paper in bands of color, and when the paint was dry, we painted over it with a tempera varnish to seal. When that was dry, we tore flower petals and leaves to assemble into a flower, and glued them onto a piece of mat board. The painted and glossed watercolor paper was easily manipulated so that the leaves and petals could be bent and curled. Phyllis (the presenter) used Model Magic for the center of her flower, but I just used fringed scraps of my painted paper. Here's a closeup of the center. Here's the table where we painted our paper. The two incredible pieces directly below were the presenter's examples. I did my center differently because while I loved her flowers, her Model Magic centers made me think of golf balls! And here's a couple of pieces made by some workshop attendees. And I love this - it's someone's painted paper that petals have been torn from. I saw it on the floor, and I thought it looked like a mysterious landscape on another planet! We also did a project which uses layer of acetate, drawn on with Sharpie Paint Markers, inside a box. The layers are separated by 3 D-O's. Participants came up with great ideas for their layered artwork, but I had left this project for last and with limited time, just did layers of colors and swirls and such. Here's a closeup. I think this project would be more effective if there were slots cut in the top of the box to allow light in between the layers. Maybe I'll take a mat knife to my box and try it out! Look at this! Another workshop attendee was making a dragon lair! I absolutely love this, and would love to see how it turned out when completed. The third project (yes, four hours, three lesson ideas to try out, and all materials provided for us by Sax/School Specialty!) was fun and easy. Small rectangles of black mat had been pre-cut in various dimensions, and we used the paint markers again to create a dimensional piece, by stacking small pieces of mat board under some of the pieces when it was glued together. OOPS this photo below is actually sideways! Here's a couple of closeups showing the levels/layering. I loved all the unique ideas and solutions to this project by the other workshop attendees, so I want to share some here. Look at this one, below. It's an absolute WOW!! This one below looks like a fun whimsical solution! And this one, which takes the rectangles and makes them into circles by the way they are colored. I used to have a set of botanical tea mugs with covers, and these remind me of those mug covers! And the dimensional approach to this one is very cool. This one below was colored with Colorsticks around the images,and I really like the vivid turquoise color contrasting the black, and the images drawn with paint markers. An interesting 4 seasons piece, made more interesting by the diagonal placement of some of the elements. I don't think it was done when I photographed it. And finally, this person took the clear acetate from the second project, and incorporated it into the third project. Very cool.